This is a standout Eastbay 49HX. A few defining features are her wonderful (and rare) layout, custom 1" thick acrylic door into the pilothouse, TNT hydraulic swim platform, bow/stern thrusters, low engine hours, and excellent condition. Eastbays this nice don't last long so call to schedule your personal inspection today. This is a boat worth getting excited about for three reasons: layout, equipment, and condition. 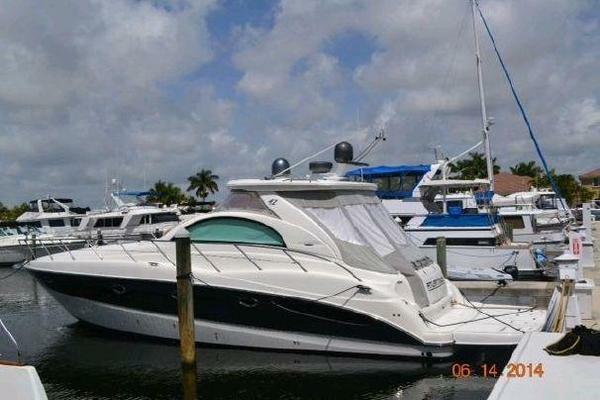 The layout on this boat is one that is very rare yet very attractive for most Eastbay owners. The master cabin is much larger with more storage and floor space than the standard layout. The guest cabin berth is more accommodating for a couple, has more storage, and has access to the washing machine (rather than going into the engine room). The guest head on the standard Eastbay layout is a wet-head, on board your guests have private access to a separate shower stall. The pilothouse layout has two large forward facing bench seats with freshly upholstered cushions that offer much more storage under the bench seats, storage which would be lost if you had free-standing single chairs. The flow from the cockpit to pilothouse is greatly enhanced by the custom 1” thick acrylic door into the pilothouse. The swim platform drops into the water to lift a tender out of the water with the assist of a hydraulic TNT lift. For the hot summer days, the pilothouse has the optional 2nd air conditioner. The galley has two large refrigerators with the optional top-access freezer. The galley also has a propane stove/oven so you don’t have the run the generator while on a mooring. This vessel has been kept in excellent condition. The owners had the exterior teak stripped and refinished in summer of 2017, the aft canvas is new and improved (spring 2017) with the snaps replaced by a track system for easier use and a cleaner look. The hull is awlgrip dark blue. The 1000hr engine service has been completed. The aftercoolers and heat exchangers were removed, cleaned, and pressure tested winter of 2017. In the aft port corner is an L-shaped settee and custom hi gloss teak table. The Galley on board is appropriately outfitted for distance cruising. Refrigeration space is maximized from two large Grunert cooled refrigerators and a large top-accessed freezer. She also has a propane stove/oven so you don't have to use the generator to cook while on a mooring in a quiet harbor. The Master Stateroom is much larger so a couple can freely walk about the cabin without feeling congested. Storage is space is also improved. The main engines have low hours and are well documented on being very lightly used with 69% of their life at low idle. This engine is designed to have 100,000 gallons of fuel burned and a report from February 2016 states that only 8,000 gallons of fuel has been burned on the engines.